Watch any commercial break in full, it seems, and you’re almost guaranteed to see an ad for some sort of voice assistant device. 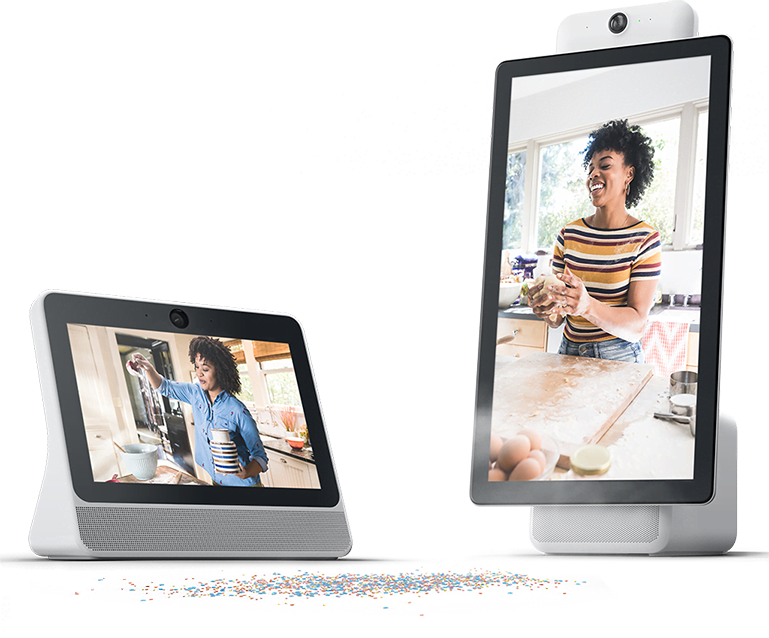 In the past two months alone, Amazon, Facebook, and Google have all announced the release of either new or new versions of their own video smart speakers: voice-assistant-enabled devices that are also equipped with video capabilities. But before the video smart speakers came along, there were the voice assistants themselves: the Siris, Alexas, and Google Assistants of the world that with a touch of a button or a simple vocal command can answer our questions, make phone calls on our behalf, or schedule reminders. It’s that first task — answering our questions — that may have the greatest long term potential. At least 20% of all mobile search queries on Google, for instance, are done by voice: a number that many predict will continue to rise. But where do internet users themselves see voice search going — and how does it align with how they prefer to seek information online today? We decided to find out. 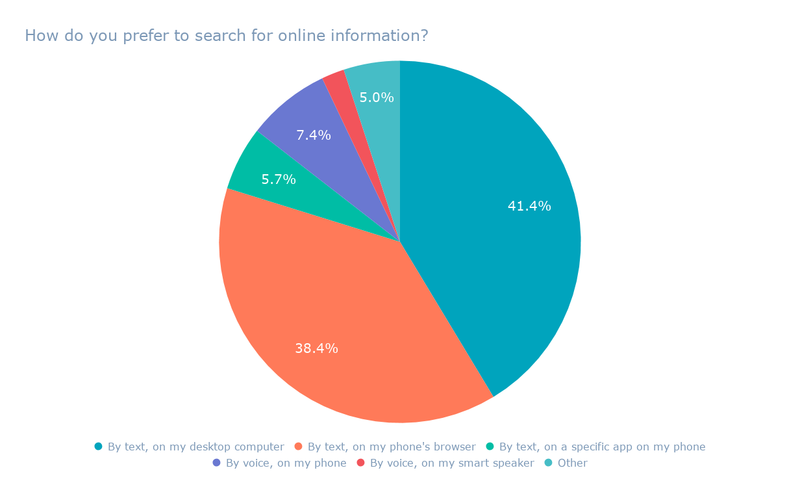 We asked 800 internet users across the U.S., UK, and Canada: How do you think searches for information online will change within the next five years? About a third of respondents believe that, while most searches will be done by voice, text searches won’t be completely eradicated. 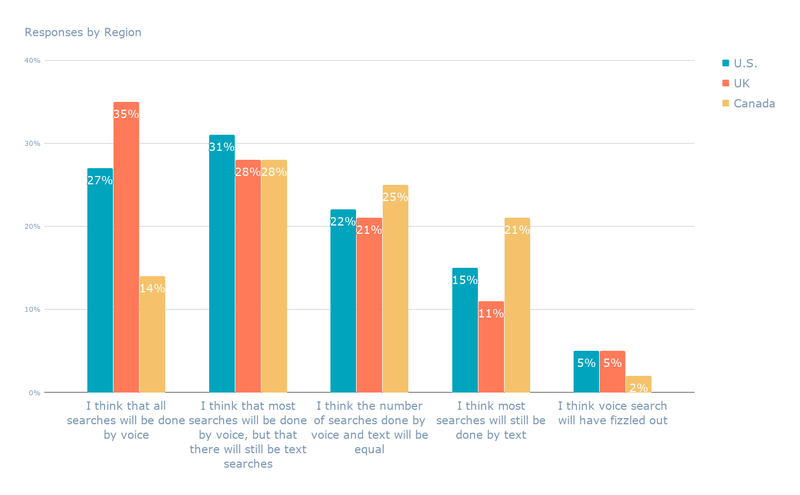 But when it comes to a future where voice search overtakes text completely, about a quarter of respondents identified that as their predictions. 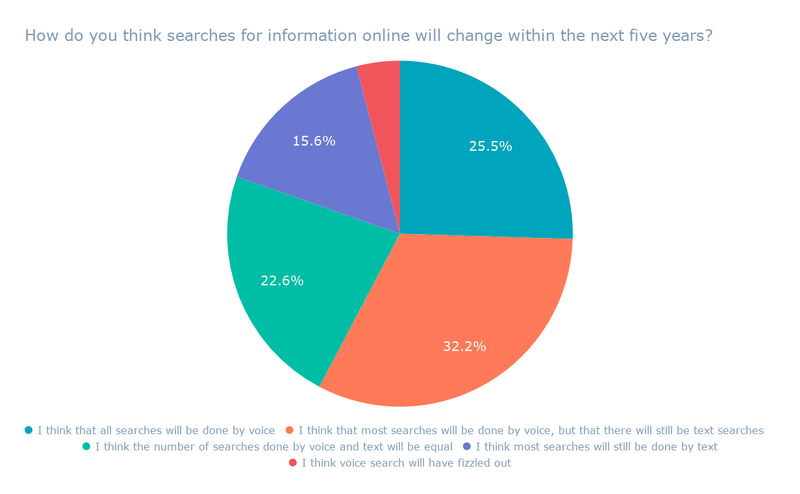 That was especially true among respondents in the U.K., where the highest number of respondents — 35% — said that they believe most searches will be performed by voice within the next five years. That most respondents foresee a future where most searches will be done by voice, but text search will still remain, is reflected in some moves by the companies that build voice assistants. When Google recently revamped its Assistant app, for example, it made it easier for users to enter commands or search queries by voice and touch — after discovering that nearly half of all interactions with it included both. It also aligns with what appear to be current user preferences, which we discovered when we asked another set of 800 internet users across the U.S., UK, and Canada: How do you prefer to search for online information? Interestingly, most users still prefer to search by text — on their desktops — while a slightly smaller number prefer to search by text on mobile. If most users still prefer to search by text, how can voice overtake it as the preferred method of seeking information online? Historically, this phenomenon has repeated itself with many advancements in technology. Just as millions of consumers have acclimated to an increasingly digital world — with the permeation of things like social media, streaming entertainment, and online video potentially replacing cable — the trajectory of voice search adoption could follow a similar path. That trajectory may also play out with the growing adoption of voice-equipped devices, such as smart speakers. According to Nielsen, 24% of households reporting having a smart speaker, which is an incremental increase from the previous year. As always — stay tuned.